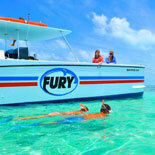 Fury's Key West Dolphin Watch and Snorkel Cruise is an exciting three-hour cruise that enables guests to observe these spectacular marine mammals. The fast catamaran voyage is an eco-friendly Dolphin SMART certified tour that boasts a 96 percent success rate for spotting bottlenose dolphins. You will also cruise into the Gulf of Mexico backcountry for the opportunity to snorkel for an additional hour in the clear turquoise water. Explore the ethereal undersea world of the National Wildlife Refuge. Snorkel gear and instructions are provided as well as complimentary beer, wine, water and soft drinks. 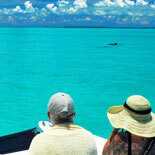 Climb aboard Fury's Key West Dolphin Watch and Snorkel Combo Tour for an incredible voyage that observes bottlenose dolphins as they frolic in the sea. As you make your way to the habitat, the experienced captain and crew will entertain you with interesting and fun facts about Key West's estimated 200 resident dolphins. Watching these beautiful mammals feed and play in the shimmering turquoise water is an experience that guests will cherish for years to come. The Dolphin Watch and Snorkel tour is certified as "Dolphin SMART," a preservation program created by several conservation groups, including the Whale and Dolphin Conservation Society and NOAA's National Marine Sanctuary as well as the National Marine Fisheries Service. The day on the water continues with a journey to country's third oldest wildlife refuge that was created by the avid naturalist President Theodore Roosevelt in 1908. Guests can snorkel and explore the world beneath the shallow waters of the Sponge Gardens of Archer Key or the multicolored coral of Cottrell. You will be provided with top-of-the-line equipment and expert instruction on how to get the most of your snorkeling experience. Swimmers of every skill level will view coral, sponges and schools of tropical fish. During the trip back to the dock, guests can relax and enjoy the scenic ride with complimentary drinks, such as beer, wine or soft drinks. 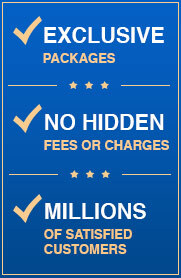 Do not miss the chance to participate in the adventure of a lifetime. 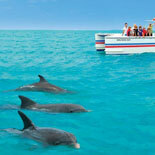 Make reservations today and obtain eTickets for the next Dolphin Watch and Snorkel Combo tour. 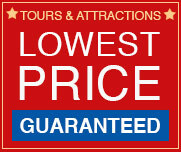 Departs daily at 9:00 am,12:30 pm and 5:00 pm (last trip of the day includes sunset). Sunset times vary depending on season. Time is confirmed with purchase online. Please arrive at least 20 min early to check in. Reservations are confirmed for time and date selected. Located at the corner of Greene & Elizabeth St.
Child Ticket: Ages 4-10 years old. Children Ages 1-3 Free.